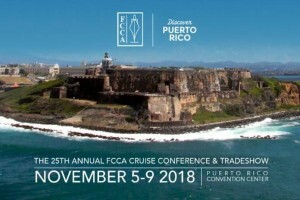 SAN JUAN - The Florida-Caribbean Cruise Association (FCCA) Cruise Conference and Trade Show, the largest and only official cruise tourism conference and trade show in the Caribbean, opened in San Juan, Puerto Rico, on Tuesday. Taking place until November 9, the event has gathered over 1,000 attendees and the most executives from FCCA member lines in the event’s 25-year history, more than 150 total and over ten presidents and above, for a series of meetings, workshops and exhibiting and networking opportunities to foster understanding, relationships and business. Goldstein also helped launch the event with remarks at the opening ceremony praising the partnership displayed between the industry and destinations, especially over the last year, before welcoming other speakers to help further honor that partnership and commemorate the historic event: Luis Rivera Marin, lieutenant governor of Puerto Rico; Carla Campos, executive director of Puerto Rico Tourism Company (PRTC); and Allen Chastanet, prime minister of Saint Lucia and chairman of the Organisation of Eastern Caribbean States (OECS). Pierfrancesco Vago, executive chairman of MSC Cruises, delivered the keynote address, with an emphasis on partnership and challenging the status quo. With the event now completely open, so are attendees’ opportunities to develop mutual understanding and success with the historic cruise executive delegation through an agenda balancing business and fun, from meetings to social functions. Meetings will take place throughout the event, ranging from the heads of state forum between high-ranking government officials and top-level FCCA member line executives, to pre-selected one-on-one meetings for delegates, where they can give a pitch and receive everything from individualized input to business opportunities from executives who decide where ships call, what sells on board and how to invest in products and infrastructure. The Trade Show has expanded the target to capture the attention of the influential audience. Any booth will put a product, company or destination on participants’ and executives’ minds, but special pavilion options will make the greatest impact with grand sizes, prime locations and the opportunity to showcase a destination or company as a team and even host private meetings with high-level executives directly in their pavilion. All participants also can meet and mingle with the executives at unique networking functions giving a taste of what Puerto Rico has to see, do and eat. Alongside informal gatherings and lunches throughout the meetings, workshops, Trade Show and VIP room, the event features nightly social receptions. Open to all attendees and participating executives, they will mix the group to create or grow relationships that lead to mutual understanding and success – all while being enchanted by some of Puerto Rico’s local sights, sounds and flavors. With Casa Bacardí, Vivo Beach Club, Bella Vista Terrace and the Trade Show floor itself hosting the events, features include live music, cultural dancing and other local tastes like food stations from roast pork to ice cream and buffets with salads, artisan breads and local delicacies from chicken and cheese to pineapple kebabs with sauce from Bacardi rum. There will even be tours available for all participants and executives. Launching the morning of Friday, November 9 and wrapping the event, the tours will provide an unforgettable opportunity to develop relationships and business. While spelunking in Cueva Ventana and discovering the local Taíno culture, getting a different taste of culture through the Bacardi rum tasting tour or walking food tour in San Juan’s newest dining destination, La Calle Loíza, or shopping ’til they drop at the Mall of San Juan, attendees and executives will learn more about both Puerto Rico and each other. Additionally, lessons about the industry’s inner workings and building mutual success will form the curriculum of workshops led by expert panels of executives and destination representatives. The participating chairmen of FCCA member lines – Micky Arison, chairman, Carnival Corporation; Richard Fain, chairman and CEO, Royal Caribbean Cruises; and Pierfrancesco Vago, executive chairman, MSC Cruises – took the wheel following the opening ceremony. During their “Chair Talk,” they are shining the spotlight on trends and developments driving the industry’s record success and future growth, along with how it all relates to specific topics, and can grow business, for the stakeholders in attendance. Presidents and CEOs were due to take the stage later Tuesday afternoon. Michael Bayley, president and CEO, Royal Caribbean International; Christine Duffy, president, Carnival Cruise Line; Roberto Fusaro, president, MSC Cruises (USA); Jason Montague, president and CEO, Regent Seven Seas Cruises; and Andrew Stuart, president and CEO, Norwegian Cruise Line, will join the moderator and FCCA president, Michele Paige. They were due to deliver the “Presidential Address,” discussing some of the differentiations and innovations driving the unique cruise brands that are going all in to stand out and appeal to their target markets both on board and on land – and how and why working together with destinations and stakeholders leads to benefits for all. High-level executives representing numerous sectors throughout the industry will get the floor on Wednesday. Carlos Torres de Navarra, vice president, global port and destination development, Carnival Corporation, and chairman of the FCCA Operations Committee, will moderate “Creating Great Destinations: From Demand to Experiences, Ports to Tours” with a panel including Russell Benford, vice president, government relations, Americas, Royal Caribbean Cruises; Russell Daya, executive director, marine and port operations, port developments and itinerary planning, Disney Cruise Line; Albino Di Lorenzo, vice president, cruise operations, MSC Cruises USA; and Christine Manjencic, vice president, destination service operations, Norwegian Cruise Line Holdings Ltd. They will share what draws passengers to destinations and creates unforgettable memories once there, revealing how to increase both demand and guest satisfaction from an overarching destination level to individual port, tour and transportation options. The final workshop will take place on Thursday and gather top representatives from both the cruise line and destination sides, including Adam Goldstein, vice chairman, Royal Caribbean Cruises, and chairman, FCCA; Richard Sasso, chairman, MSC Cruises USA; Giora Israel, senior vice president, global port development, Carnival Corporation; Beverly Nicholson-Doty, commissioner of tourism, US Virgin Islands; and Carla Campos, executive director of Puerto Rico Tourism Company (PRTC). In “Investing in Your Future,” they will review ways in which both parties are preparing for their long-term futures, and how those plans often involve partnership with each other, from port and destination developments, new attractions and even agreements preserving natural elements, to business continuity, emergency plans and best practices. Overall, the blend of business sessions and casual interaction will create the perfect forum to exchange information and industry trends, share ideas and proposals, and cultivate valuable relationships – and an expected ratio of about one cruise executive per seven attendees will offer great odds to meet and gain insight from the prominent executives.